This Saturday my boyfriend and I went to the Mosman Park EcoFair, which was just a few suburbs over from where we live. The fair takes place in the beautiful grounds of St Luke’s Church and community garden, and was a mix of stalls selling organic and fairtrade food, traders selling eco goods, seedlings, vintage clothing and all things green, and some great demonstrations and workshops. Combined with the perfect weather and fantastic atmosphere it was a really fun afternoon out. I saw a great ‘Food Theatre’ workshop run by Chris Ferreira from The Forever Project and Hannah Sfornica from A Foodly Affair which combined sustainable (and water-wise) gardening with cooking and talked about the importance of good soil, the importance of organic and locally sourced food, how what you eat is made from what you put in the soil and your body is fueled from what you eat. Sustainability and real food, two of my favourite subjects! Hannah made the most amazing raw pumpkin soup for the audience to try. Both Hannah and Chris are fantastic presenters, and Hannah is both an inspiration and a wealth of knowledge and practical advice regarding ‘mindful’ eating, as she likes to call it. I would thoroughly recommend attending the workshops they run if you’re in the Perth area. But my absolute favourite thing about the fair was that there was no disposable single-use plastic – no plastic bags, no takeaway cups, no plastic straws, no plastic water bottles and no plastic throwaway plates. And this was achieved in such a simple way – by having a washing-up station! All of the food stalls used ceramic plates and mugs, provided by the Church or sourced from various op shops, which were happily washed up by a team of dedicated Western Earth Carers volunteers. It’s such an obvious concept really, doing the washing up, and the people who volunteered seemed to be having a great time in the sunshine, chatting to everyone that passed by and doing an awesome job of raising awareness of single-use plastic, and how easy it is to avoid with just a little bit of thought and effort. And the result of their efforts was fantastic. 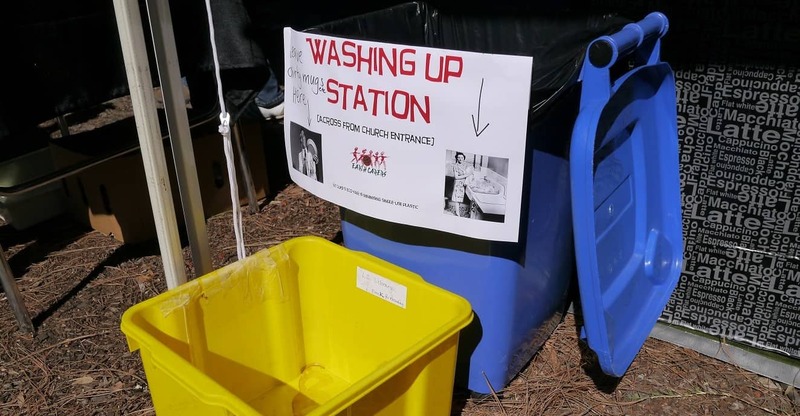 The organizers were told they would need 20 bins for the size and length of the event (with over 65 stalls plus other activities over 6 hours) but instead, for the whole day, the waste that was generated filled just three recycling bins and one landfill bin. Result! I posted your blog about the Mosman Park Eco fair on my Facebook page, ‘No to Plastic’ . Am enjoying your blog.I am also in Perth. No to plastic…what a fantastic idea! The washing up station should be used all over the fairs that happen during the summer :) m.